Having recently celebrated International Women’s Day 2019, we reflect on the political participation of women, particularly in conflict resolution and peacebuilding processes over the years. The landmark resolution of the United Nations Security Council on Women, Peace and Security is high up on the list of events that have recognised the role of women in peacebuilding initiatives. Through this blog, we attempt to understand its achievements and identify its shortcomings. We revisit the resolution and discuss ways in which its vision can be realised in the world today. In 2000, the United Nations Security Council unanimously adopted the Women, Peace and Security Resolution 1325 calling for an increased participation of women at all decision-making levels and appealing for their protection during conflict. Often called a landmark achievement in recognising the gendered nature of war and potential role of women in peacebuilding, UNSCR 1325 was a result of multiple factors- the changing nature of conflict by the end of the 20th century, the emerging conception of human security as a departure from the limited notion of state security, and the efforts of NGOs and civil society organisations. The collaboration and coordination among various NGOs and activists was not a mean feat given the diversity they represented. Gender and security- two areas that had hitherto seldom been merged- were recognised as not only interrelated but inextricably linked. 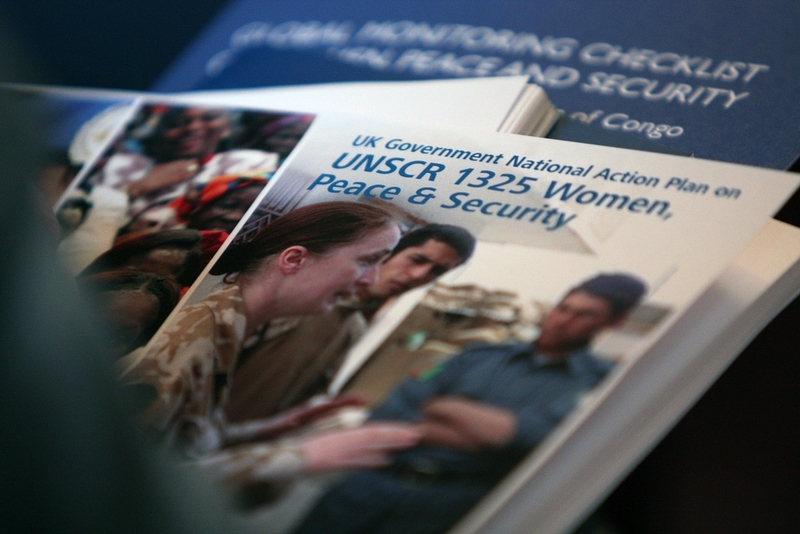 UNSCR 1325 was thus, in many ways, a success. To appreciate 1325 as a milestone for the Women, Peace and Security agenda is not to place it beyond the reach of scrutiny and critique. After all, a change is not just marked by the vision it espouses but also by its potential to alter reality. UNSCR 1325 faces multiple accusations on this account. First, its translation into national legislation in form of National Action Plans was quite unsuccessful. Bangladesh which was at the forefront of supporting the resolution did not introduce a NAP until 2017 and is yet to release it. Second, it does not acknowledge nor address the structural and institutional barriers that obstruct women’s participation in decision making bodies. Third, UNSCR defines women as homogenous category thus negating feminist calls for the consideration of intersectional identities. Even after almost two decades of the resolution being passed there remain some critical questions waiting to be answered. What impact did the resolution have on the lives of women (and men) around the world? Taking a step back, did it have any impact at all? Did UNSCR 1325 cross the threshold of the international organisation where it was passed? Did it make way into national legislations and policies? Did its advocates continue to ensure its proper implementation? That being said, what should be done to effectively implement UNSCR 1325 and positively impact on lived experiences of women around the world today? Here, we attempt to identify the tasks at hand that are indeed requisites to UNSCR 1325 being called an actual success. There is a critical role both for international and national civil societies to ensure that the resolution moves from being a mere formal document to a living reality. Lobbying governments to increase female representation on decision making posts, advance women’s education, and address structural gender-based inequalities, are important steps towards a more conducive space for the realisation of the goals of 1325. The international civil society that was very active in bringing forth this resolution through numerous collaborations and partnerships now has to leverage its strength to exert pressure on governments to get past bureaucratic bottlenecks and lack of political will to undertake reforms that disturb the status quo of male dominance at all levels. UNSCR 1325 is not far fetched from the lives of ordinary citizens. It purports to bring a change in the lived realities of women (and men) through increasing participation of women in building and maintaining peace. As citizens of a world where gender equality is still a distant dream, we can make the most of the underlying essence of 1325 to uplift women’s rights and include them in decision making processes. We can make efforts to contain the resolution from seeming like a marketing tool that merely fosters the image of the UN as the caregivers of women’s rights. In a world where we are witnessing gender-based violence as almost a routine practice, we can seize the opportunity to expand the vision of 1325 and make women active participants in ushering in an equal world order. As members of an entrenched patriarchal setup, the onus is as much on us as on our institutions to bring about a real change. We can start from our homes by educating girls, valuing their opinions and go on to influence our community, society, nation, region, and eventually alter the skewed gender-based power relations in the international arena. We might need to reframe some norms and reconstruct notions of gender. Violence and discrimination towards women won’t end if we fail to address underlying socialised norms of masculinity, strength, and power. ‘Imagined realities’- the concept that emerged with Yuval Noah Harari- is a fascinating way to reconstruct and rebuild the old collective belief. Perceiving gender equality as the norm rather than an unattainable goal may aid in turning the vision of non-discriminatory, inclusive participation of people of all genders as change-agents into reality. The key might just be to reimagine our own realities and identities. Then, the text of the resolution will not define the boundaries of its impact and we shall see a graduation from the letter of 1325 of urging for change to its spirit of creating a gender equal world order. Anushna Jha (@anushnajha) completed Master’s in Development Studies in 2018 from the department of International Development at the LSE. She has previously worked with the Department of Social Welfare, Government of Bihar, India and Vidhi Centre for Legal Policy, a think tank based in New Delhi, India. Her research interests include education policy, gender and education, and public private partnerships in public services. Youmna Cham previously worked as a Researcher for the UNDP Project at the Ministry of Economy and Trade in Beirut providing support in the planning and implementation of various SMEs, Trade and Economic policies. Her research interests include Gender, Power-sharing model and Sexuality. She completed her MSc in International Development and Humanitarian Emergencies from LSE in 2018. Valerie Gebhard completed her MSc. in International Development and Humanitarian Emergencies from the ID department, LSE in 2018. She currently works at Save the Children UK. She previously worked with Aktis Strategy Limited, a management consulting firm headquartered in London. All the best for the bright future.